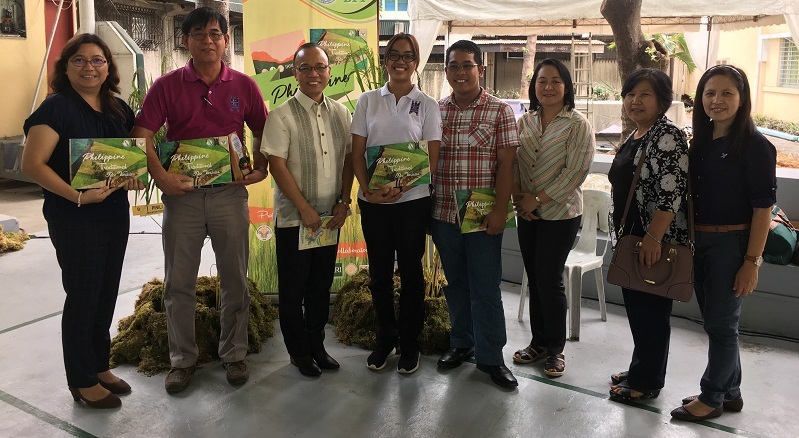 MANILA, Philippines—The Department of Agriculture (DA), through the Bureau of Plant Industry (BPI), launched Philippine Traditional Rice Varieties, the country’s first seed catalog of indigenous rice varieties. This catalog is the first publication of the Bureau for traditional rice varieties, according to Dr. Vivencio Mamaril, officer-in-charge of BPI and a project leader at the National Seed Council. Traditional farmers continue to grow these indigenous rice varieties because of their resistance to pests and diseases, low fertilizer requirements, and good eating quality said Mamaril. He added that plant breeders also use traditional rice varieties as sources of germplasms for developing new varieties because of their exceptional ability to withstand environmental and biological stresses as well as their excellent aroma and grains. Philippine Traditional Rice Varieties is a collaborative effort of BPI, which implements the DA’s programs on the plant industry sector, Philippine Rice Research Institute (PhilRice), Agri-Pinoy Rice Programs, and the International Rice Research Institute (IRRI). It contains photos, physical descriptions of each variety at various growth stages, quantitative traits of its grains, place of origin, and other information collected by the participating research institutes. The catalog was launched during the 87th-anniversary celebration of BPI on 18-19 January. During the event, the DA presented an award to the various projects that contributed to the seed catalog: DA-PhilRice project on Profiling Traditional Varieties, BPI-IRRI project on Characterization of Philippine Traditional Varieties, DA-IRRI Heirloom Rice Project, and the National Seed Council. The award was given to Renato Reaño, the lead of the Characterization of Philippine Traditional Varieties project, and Dr. Casiana Vera Cruz, head of the Heirloom Rice Project, for their “significant contributions through their technical expertise in varietal characterization of Philippine traditional rice varieties.” They shared the honor with Loida Perez of PhilRice and Mamaril. 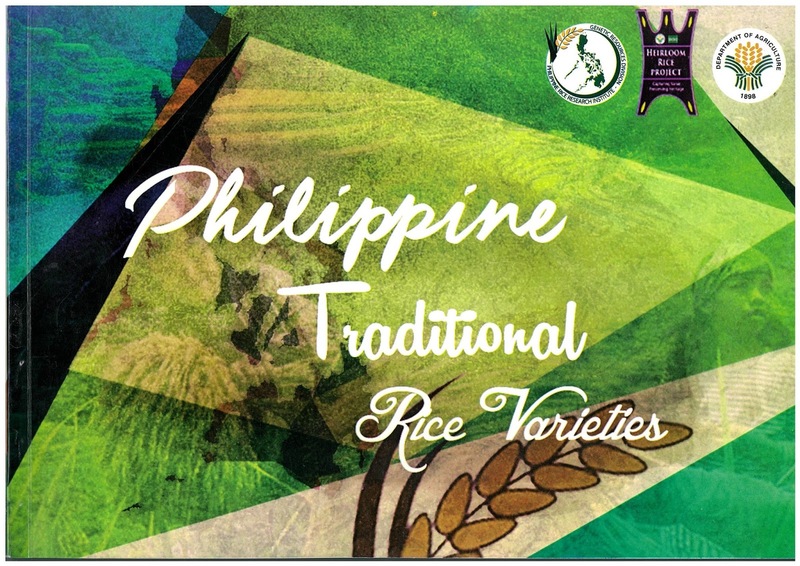 The Philippine Traditional Rice Varieties Seed Catalog is a manifesto to the Philippines as a country blessed with the bounties of nature, according to the DA Secretary Emmanuel Piñol. He also described the catalog as an important part of the country’s effort to modernize the rice sector for the Filipino people. Some members of the projects that contributed to the country's first seed catalog of indigenous Philippine rice varieties (from left to right): Ana Cope (IRRI), Renato Reaño (IRRI), Vivencio Mamaril (DA-BPI), Pauline Capistrano (IRRI), Joseph Sandro (IRRI), Marissa Romero (PhilRice), Magdalena Wanawan (DA-RFO CAR), and Virginia Tapat (DA-RFO CAR). IRRI communication and partnerships chief Bruce Tolentino (right). 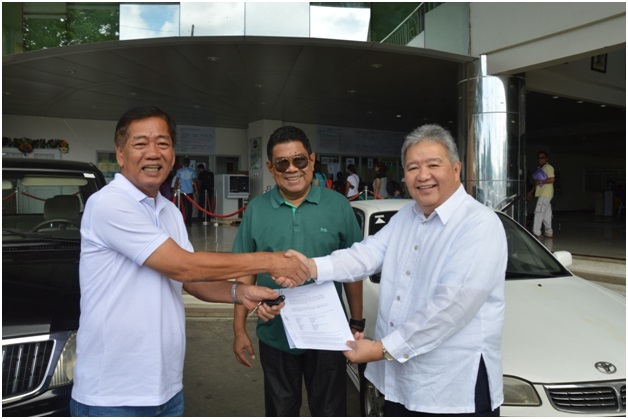 LOS BAÑOS, Philippines—Thailand continues to explore ways of deepening its ongoing collaboration with the International Rice Research Institute (IRRI) through H.E. Mr. Thanatip Upatising, the Ambassador of Thailand to the Philippines. The Thai ambassador visited IRRI on 17 January to know more about its current partnership with Thailand and explore areas of further cooperation to strengthen regional food security. "Thank you so much for the kindness and hospitality you extended to me,” said H.E. Thanatip. “This is my first time to visit IRRI. In fact, IRRI is a renowned institute since I was young. I came here to exchange information and see what can be done for the benefit of IRRI and member countries." IRRI Director General Matthew Morell emphasized the importance of Thai-IRRI collaboration in rice research. He underlined the benefits that flow from rice research into the rest of the Thai economy, as well as the economies of several other Asian nations. 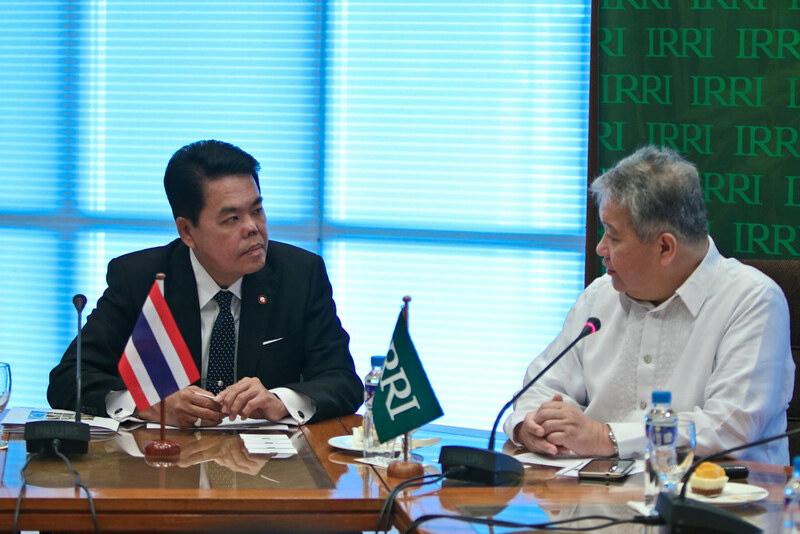 Morell also requested the Ambassador’s assistance in facilitating the Host Country Agreement between Thailand and IRRI, which will set the framework for IRRI’s research in Thailand. The Ambassador was briefed by Bruce Tolentino, IRRI’s deputy director general for Communication and Partnerships, and several scientists and rice experts at the institute on past as well as current IRRI-Thailand cooperation in rice research. IRRI has at least 10 ongoing projects with partners in Thailand. The projects cover the whole rice value chain, from breeding to postharvest. Training and capacity building are also part of the collaborative activities between IRRI and Thailand. Although Thailand is the leading exporter of indica rice in the world today, the Thai ambassador related how many Thai farmers experienced problems and confusion when exporting rice in the 1960s because of import requirements. "If the grain is 70% intact, we still classify it as ‘whole grain’ in Thailand,” he said. “But in Canada and Europe, they classify whole grain rice as at least 90% intact. So most of the shipment were rejected by the importer [as broken rice]. That created a lot of problems and confusion." In response, IRRI scientist Sarah Beebout explained that the Sustainable Rice Platform (SRP) this addressing the issue. SRP is a multi-stakeholder platform that aims to harmonize the different quality standards and create tools for rice growers to use in order to meet the standards. Commissioner Mutelo (third from right) looks forward to a potential partnership between IRRI and the University of Namibia to train its MS and PhD agriculture students. Also in photo (from right): Consul William Co, consulate of the Republic of Namibia, Rector Mutelo; IRRI’s external relations head Corinta Guerta; IRRI partnerships office head Michelle Weldon; and Heritha Nankole Muyoba. LOS BAÑOS, Philippines—Although corn is Namibia's primary food staple, the government is keen on expanding rice production to improve its food security. Research has shown that the crop can be successfully grown in Namibia's seasonal wetlands. But frequent droughts that occur in the semi-arid country pose a threat to its rice production. 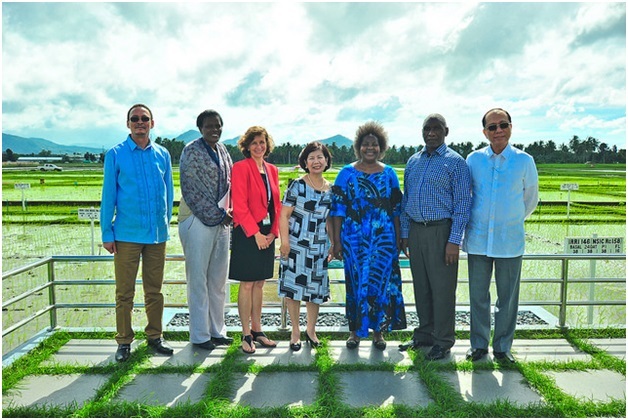 A delegation from Namibia, headed by High Commissioner Anne Namakau Mutelo, visited, the International Rice Research Institute (IRRI) on 12 January to learn about its high-impact research activities, particularly on drought. "We've learned a lot," said Commissioner Mutelo. "We saw how different countries, nationalities have come together here to conserve rice, improve its production, and generally ensure global food security." Rector Mutelo, chief executive officer of Namibia Biometric Systems, commended IRRI’s partnership-driven research. "This is the United Nations of rice," he noted. Heritha Nankole Muyoba of RMZ Consulting, a private educational and business organization in Namibia that works with farmers, said what IRRI offers Namibian farmers are drought-tolerant and climate change-ready rice varieties. The Namibian visit also served as an opportunity to explore possible areas of collaboration with IRRI. "We are planning to start with a memorandum of agreement that links the University of Namibia with your institution so we can train our MS and PhD students as well as build the capacity of our agricultural personnel," said Commissioner Mutelo. Laciste (left) makes sure that the Philippine rice program gets a head start in 2017 as rice is a priority for the Duterte administration. Also in photo: IRRI communication chief Tolentino (center) and Quilang of PhilRice (right). LOS BAÑOS, Philippines—The newly appointed deputy director of the Philippines' National Rice Program emphasized the importance of collaboration in developing a national strategy for rice farming and uplifting the lives of Filipino farmers. As a pro-active start to 2017, Assistant Secretary Federico Laciste of the Department of Agriculture (DA) visited the International Rice Research Institute (IRRI) on 5 January. Laciste is also the deputy director of the DA’s National Rice Program that integrates government initiatives and interventions for the agriculture sector. 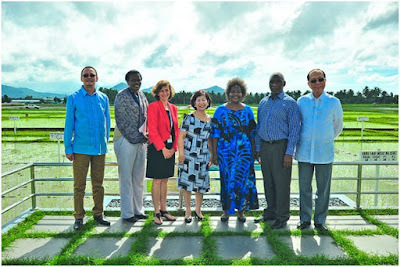 At IRRI, Laciste was briefed on the various collaborative research projects implemented jointly by IRRI and the Philippines Rice Research Institute (PhilRice) in support of the National Rice Program. 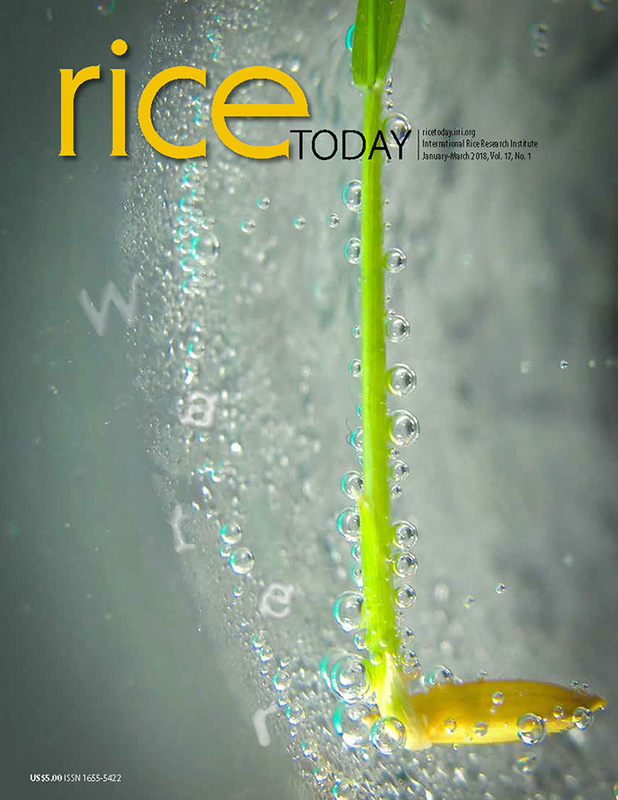 "We have plenty of work to do pertaining to rice," Laciste said. "We would be very dependent on IRRI and PhilRice in terms of formulating our program." To be more competitive farmers must produce at least 7 tons of rice per hectare at PHP 7.00 per kilogram, according to a fact sheet published from a benchmarking study of an ongoing DA and IRRI partnership project. “This is already possible,” said Dr. Jimmy Quilang, deputy executive director of PhilRice. He explained that in their Palayabangan (“rice and pride”) challenge, one farmer produced 10 tons of rice in a hectare at only PHP 5.00 per kilogram. "With the technologies that we have developed with IRRI, we already have ways to really make Filipino farmers more competitive,” Quilang said. A retired police officer, Laciste studied at the University of the Philippines Los Baños in 1975.